However, if we stop there, believing the only thing at play here is the need to say a few flattering words to or about God in order to get on His Most High Holy Good Side, boy we are missing out. 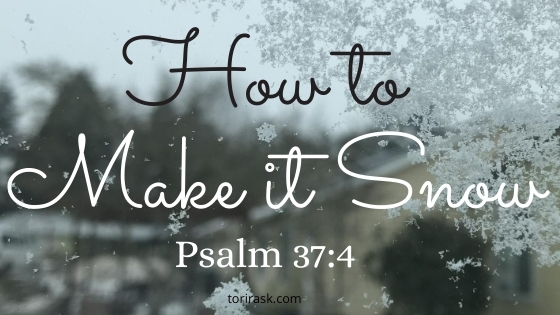 Not only we will end up staring out the window with our jammies on inside out wondering why it’s not snowing, but we will miss out on massive amounts of grace and blessings that are waiting for us. In Matthew 6:21, Jesus says that where our treasure is, so will our hearts be also. If we store up our treasures in the world, the world is where our heart will be and the world is what we will value. The same is true of our delight. If we are taking delight and pleasure first and foremost in the things of this world, then our hearts and their desires will conform to the things of this world- which are not always good for us. The world is fallen and full of sin and brokenness and baggage, both other people’s and our own. Heart’s desires that are born of that mess can easily be motivated by jealousy, lust, a need to prove ourselves, the desire to amass worldly treasures, or any number of attitudes of heart and mind that are not healthy for us. Asking our Heavenly Father for these desires can be a lot like my kids asking for a lollipop right before dinner: I can’t grant it, because it’s not good for them. But if we start delighting in and treasuring the Lord, then our hearts will start to align with His and our desires will start to look a lot more like His heart. God is a good, good Father who made this world and everything in it, including us. His heart is not just about how things are, but about how they should be. His plans are for our good and for His glory, and if we start desiring things in alignment with that, they will be healthy and fortifying and good, good, good, good. It’s like my kids asking me for an apple or a carrot: heck yeah, I’m going to grant that! It’s healthy for them! Aligning our hearts with God’s can sound a bit daunting, but this verse from the Psalms lays it out for us: if we work on fixing our eyes and placing our delight in the Lord, it will open the door for Him to do the heavy lifting in our hearts. For some of us, the assignment to delight ourselves in the Lord may be fairly easy, just a reminder to dig deeper or return to something we’ve been doing for years. For others of us, however, we may feel like “delight thyself in the Lord” is easier said than done. Maybe we’ve tried before and failed, maybe we are new to the Kingdom and don’t know where to start, or perhaps we are feeling a bit disgruntled toward God for one reason or another and delighting in Him sounds about as appetizing as eating a mud pie or running an ultra marathon in heels. I promise you that no matter where you are with this, God will meet you. Take a moment right now to breathe in and out, close your eyes (it’s ok to stop reading for a minute), and say, “Lord, teach me to delight in You. Lead me along the paths you’ve laid out just for me that lead to You.” If you’ve got fear, doubt, bitterness, straight up anger, or anything else hanging around, don’t even worry about it. Come as you are, bring it right along and offer it to God, He will listen intently to what you have to say and He can help you sort it out. He’s perfect like that, even and especially when we are far from it. Blast some Lauren Daigle or Trip Lee whatever floats your boat and sing (or rap) along as loud as you can. Watch your kids play and marvel that God made them yours. Notice the beautiful sunrise, the rhythm of the rain, the wind through the trees, or the petals on a flower- all God’s handiwork. Make a list of blessings or start a gratitude journal. Read your favorite passage of scripture and picture yourself there with God (my favorite for this is the 23rd Psalm, I will sit in a green pasture beside still water all day any day). The delight will find you and you will find it because when we seek God, He will be found by us. It’s not on our own strength, it’s on His, we just have to show up. It will change us. Sometimes, the shift is slow and almost imperceptible as He works on our hearts. But His promises don’t fail, our delight will rest more and more in Him and our heart’s desires will line up more and more with His heart. And then, we just let it snow. Inside out jammies optional.